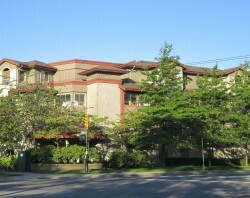 Chelsea Court is located at 2378 Grandview Highway, on the corner of Grandview Highway and Nanaimo Street in Vancouver. Built in 1994 by the West Coast Community Homes Society, it was acquired by New Chelsea Society in 2010. The complex is within walking distance of John Hendry Park and Trout Lake, convenient for outdoor recreation. 32 family units, including 17 apartments with 1 to 3 bedrooms and a mix of private self-contained townhouses with 1, 2 and 3 storey units. Community room for meetings, parties and other social events. Central courtyard with a children’s playground.